Strike King's Hack Attach Jig is an extreme Heavy Cover Jig, designed to be fished in and around the heaviest shallow and deep water cover. 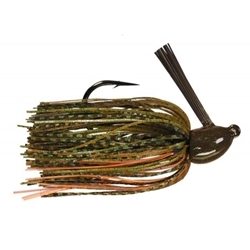 The Hack Attack Jig is built around an exclusive Gamakatsu black nickel heavy wire hook for extra bite and a 30 degree line-tie. This jig includes a heavy weed guard to help come through cover easier. It is best used on heavy Fluorocarbon or Braided line & heavy rods.